The season is filled with ski days, sledding, snowshoeing, holiday sleigh rides, gingerbread houses, après ski soaks in the hot tub, s’mores around the fire and maybe a blizzard or two in the comfort of your cozy mountain home. No, you’re not dreaming and yes, you’re at Martis Camp. All this and more is right here at your ski tips. 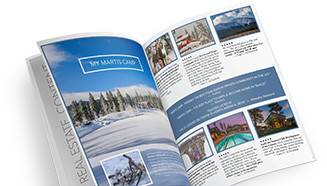 Start your days at Lookout Lodge where the Martis Camp Express Lift carries you to the top of Northstar California Resort with more than 3,000 acres of downhill terrain for you and your family to explore. Shuttle over to the Family Barn where the Art Loft, theater and bowling alley offer perfect escapes for all ages on snowy afternoons. Indulge at the Camp Lodge where twilight views glow above the outdoor soaking tubs and cold winter nights are answered with memorable family meals next to the fire. This is what makes winter glorious and this is why we love winter at Martis Camp. When the snow and the storms attempt to make the season unbearable, we give you all the ways to embrace it, ride it, dive into it and enjoy it from start to finish. From the moment your family is greeted at the Lookout Lodge valet, your day on the mountain transpires with ease. We’ll unload your equipment and transport it to the slope while you step inside to enjoy a light breakfast overlooking the ski runs. Lift tickets and anything you might have left at home ­—­ gloves? goggles? sunscreen? — are conveniently available at the private ski shop and ticket counter downstairs. Head outside to the snow where you’ll find your gear ready and waiting for you, then zip up, buckle up and glide over to the Martis Camp Express Lift where you’ll dart to the top of the mountain in just six minutes. Return to Lookout Lodge for an alfresco lunch on the terrace and end your day with Après Ski s’mores and ciders by the fire. From start to finish, every detail of your day is anticipated, allowing you to focus on what matters – family, fun and all that snow on the mountain. Gooey, melting and oh-so-delicious, s’mores are one of the best things about winter! Pick up a kit of graham crackers, marshmallows and chocolate at Lookout Lodge, then head out to the firepit where you can roast and toast to your heart’s delight. Will it be a single stack or a double decker? Either way, you’ll be coming back for s’more. Private, direct access is right at your ski tips! The Martis Camp Express Lift is just a snowball’s throw from Lookout Lodge, making your journey to Northstar California as quick and seamless as possible. In six minutes, the Martis Camp Express Lift carries you to the top of Lookout Mountain at 8,120 feet, where 3,170 acres of snowy terrain awaits you. Unbuckle your boots and head to the firepit at Lookout Lodge. Wrap up your day in a warm blanket next to a hot fire with a mug of good cheer. Enjoy slopeside snacks with ski buddies and acoustic music on the weekends. Après Ski is the place to be during winter at The Camp. Cheers to a great day on the mountain! New Year’s Eve is a magical night at Martis Camp. Our Family Barn Bash and Camp Lodge New Year’s Eve Celebration count down to the New Year with a deejay, dance floor, live music and festivities for all ages. Don’t miss the coolest part of the evening when everyone gathers outside for our Fireworks Spectacular! We paint the night sky with dynamic effect, shooting color and light above the Family Barn. Happy New Year! Venture outside and get your heart pumping while you enjoy the beauty of Martis Camp’s winter wilderness. Come to the Family Barn where we’ll get you geared up with Nordic skis and snowshoes. Our winter trail network is groomed for both activities – with tracks for classic skiing, and packed snow for skate skiing and snowshoeing. A powder day is especially fun! Buckle those snowshoes and blaze a trail of your own. Your gear will keep you afloat across all the powdery terrain you can find. The quintessential holiday experience returns to The Camp for another season! Round up your family and friends for a horse-drawn sleigh ride at the Family Barn. Climb in and bundle up as your tour through the wintry landscape begins. Circle the neighborhood, see the sights and jingle all the way back to the barn. The holidays are here at The Camp! Every March, members gather on Lookout Mountain to see who’s fastest going downhill. Racers clock two runs on a slalom course in a quest to take home the Martis Camp Downhill Cup Championship in age divisions for men, women, seniors and youth. Whether you’re a skier or a boarder makes no difference – you’ve just got to be the fastest to win. 3-2-1 … Go! It’s cold outside! Warm up by the fire while you enjoy unique dining experiences found only at The Camp. Chase away the winter chill with hot drinks and friendly conversation at the Camp Lodge Bar & Bistro. Indulge in an elegant fireside dinner in the Cliff Room featuring cuisine by Executive Chef Brett Moseley alongside a sunset view of the snow-covered Sierra Crest. The Cliff Room also hosts this season’s Winter Wine Dinners featuring Heitz Wine Cellars, Peter Michael Winery and Sea Smoke Estate Vineyards. At the Family Barn, cozy up in a booth at the soda fountain where burgers, fries and classic favorites hit the spot after a family outing at the sled hill. Over at Lookout Lodge, start your ski day with a hot breakfast before catching the Martis Camp Express Lift to the top of the mountain. Enjoy ski-in, ski-out lunch on the terrace next to the slopes, and return for Après Ski with winter cocktails, s’mores for the kids and acoustic music on the weekends. From wine dinners to family meals to après afternoons, winter dining at Martis Camp is full of warmth and good cheer.